This year's Romance Writers of America® national conference was held in the Mile High City, Denver, Colorado. I'd been looking forward to the event as I had never visited Colorado and was eager to do a bit of exploring. I flew out the Saturday before conference and joined friends Kim Lowe of the SOS Aloha blog and Australian author Kandy Shepherd in Colorado Springs. We spent the next three days exploring all the beauty that city has to offer. Here are a few photos. Exploring the Garden of the Gods was truly a spiritual experience. Nature's majesty is all around you among the ancient rocks that sit in the shadow of Pikes Peak. The walk to Seven Falls offered another stunning display of rock formations and waterfalls. Manitou Springs was a lovely western town with lots of quirky shops and a beautiful mansion/castle. The four-story Miramont Castle is open to the public and also features a history of firefighting museum, as well as authentic period furniture, and beautiful mountain views. The original owners were a French priest and his mother. While the mother's money built and furnished the castle, the priest's vow of poverty apparently didn't prevent him from enjoying it. Firefighter PJ, reporting for duty! An interesting side note: Kandy and I wandered into a jewelry story in Manitou Springs and while chatting with the owner, discovered that when he moved to town 42 years ago he lived in the castle. At that time, (before it became a museum) it was divided into apartments. Lucky him! A trip to Colorado Springs isn't complete without a stop at the luxurious Broadmoor hotel and resort. We lunched at the authentic Golden Bee English Pub. And when I say authentic, I mean it. This restaurant originally sat in England before it was dismantled, shipped across the ocean, and reconstructed at the Broadmoor. I kept expecting to hear English accents. After lunch, we walked through the beautiful hotel. I could have happily spent the entire afternoon cozily tucked into one of the reading nooks in their library. On our way back to our car we spotted this deer strolling down the boulevard in front of the hotel. Obviously, it was lunch time for her too as she found a lovely garden and was happily munching away until a groundskeeper arrived in a golf car to chase her away. Of course, it goes without saying that if I'm traveling there's going to be food photos, right? We headed out one evening for dinner at an Italian restaurant but discovered when we arrived that there would be a 30 minute wait. They suggested we might want to wait upstairs at their sister wine bar. We trudged up the stairs and discovered not only a cozy cafe atmosphere but fabulous food and the best waiter ever. We cancelled our reservation downstairs and had a wonderful evening at Sopra Antipasto & Wine Bar where we savored these delicious offerings. Our waiter very kindly had the chef make this dessert without the pastry shell so I could eat it! We capped off our stay in Colorado Springs with a visit to the Air Force Academy. One highlight of that visit was meeting these falcons and the cadets who are charged with their care. The second highlight was the incredible Chapel. This architectural wonder has a stunning exterior and an interior that fills the soul with its spiritual beauty. I could have spent hours there. 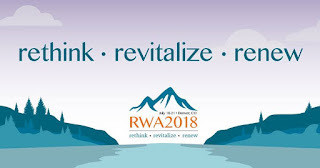 That's it for Part One my RWA 2018 adventure. More photos and stories to come! Have you visited Colorado? If so, what were your favorite parts? Did you go to the top of Pikes Peak? I'm adding a bonus second giveaway to this post. A second person who leaves a comment before 11:00 PM July 27 will also receive a book and swag from the conference. U.S. addresses only. Our son lives in Colorado Springs, so yes we have been there several times, just came back 10 days ago. Your pictures are lovely and gave us some ideas of what to see in Colorado that we have not. We have been to Garden of the Gods twice and also visited 7 Falls. Also been hiking in Estes Park and saw the little western museum and panned for gold. Did not go to Pike's Peak as my husband is bothered by the altitude as we found out at 7 Falls and Estes Park. Loved your photos. We may have been there at the same time! I didn't make it to Estes Park, Golden, or Boulder but others at the conference visited and enjoyed them. I have asthma and was bothered by the altitude so we decided to forego Pikes Peak as well. Yes we have been to Colorado Springs and loved it. We went to Pikes peak ad Garden of the Gods. It is really beautiful! Wonderful photos and great experience. I have been to Colorado and enjoyed every minute of this special and beautiful state. Aspen, Twin Peaks and Leadville were fascinting and lovely. I'd like to see more of the state. PJ, love the post. Amazing pictures. I've never been to Colorado but after seeing the great sites I definitely would visit. I do have to remember to eat before seeing the fantastic food pics. My mouth was watering :) Thank you for sharing. Loved that English Pub. Wasn't the English Pub awesome? I haven't visited Colorado, but I'd like to...especially now that it's so hot in Texas! I drooled more than a little at your chocolate dessert! Thanks for the photos, post and giveaway. I was surprised by how hot it was in Colorado. It's cooler in the very high elevations but Colorado Springs and Denver were HOT! I was in Denver for my cousin's wedding last summer. We flew in for 2 days so didn't have a whole lot of time for site-seeing because of the wedding, but we did get a chance to go to the Red Rocks for a few hours. It was absolutely gorgeous! I didn't make it to Red Rocks but saw plenty of red rocks at Garden of the Gods. So beautiful! I always enjoy your travel and conference photos. That chapel looks incredible! I haven't been to Colorado, but I hope to visit one day. Thanks for the pictures. I've never been to Colorado, so it was nice seeing everything you can do there. Your chocolate dessert looks so good. I've never been to Colorado, but my husband has (on business) and he loved it. He's got great pics of Pikes Peak. Thanks for sharing your wonderful pics. Of course, I loved the English pub pic which made me feel very homesick. Kandy has spent a significant amount of time in England and said it was very authentic. I guess it would be since it came from there, right? Anyway, as someone who has yet to visit England (outside Heathrow), it was most enjoyable. We have a pub near us in Delray Beach called "The Blue Anchor. The whole inside and outside was shipped over from England, too. It's a transported London Pub from the 19th century. I have never been to Colorado, but hope to one day. Your photos are spectacular, and I can only imagine how much more beautiful everything was in person! Thanks for sharing your visit with us! Colorado is on my bucket list of places to go and also pikes Peak. Great pics. Super jealous. I haven't been to Colorado. Thanks for sharing your photos. Looks like a wonderful trip. that looks like a fabulous trip! I've only flown over Colorado, but I've got some relatives there now so I might have to make a visit. I have family in several different places in Colorado. And as always, when I am there, I am reminded that God does amazing work. Generally, I am simply driving around visiting cousins. I loved your pictures. And as beautiful as Colorado is, you took pictures with a few of my very most favorite authors. OK, so none of the authors, no matter how much I love them, do not quite compare to some of God's good works. Yes, the Broadmoor is wonderful from the pictures. I loved the library. I really liked the look of the cheese stuffed tomatoes. Now - the dessert, is a sample of that part of the package for the winner? If not, could it be? If not, because you intend to keep it all to yourself, I certainly understand. My Grandmother lived there. Yes I've been to Pike's Peak, The Garden of the Gods, Red Rock Canyon, the Continental Divide and panning for gold. It was always an adventure. Yes we went to the Air Force Academy and the Chapel is still amazing. When they say purple mountain majesty, pictures just don't capture the sunsets. I used to walk to this bridge in the evening to just watch the sunsets. It is an amazing beautiful state and I'm looking forward to going back. I drooled at everything! And how amazing was that library! I've never been to Colorado but after seeing your pictures I'll make it my next destination for a vacation. Loved seeing your photos! I lived in Colorado Springs for a year when I was in high school (my stepdad was stationed in Ft. Collins.) My family went to Pike's Peak but I was too scared to go up into the mountains after hearing horror stories from the locals. Love the photos PJ! That dessert looks amazing! I loved the photos!! Other than the airport I've not been in Colorado, it is one place I want to visit. Yes I drooled seeing that chocolate dessert. My husband was stationed at Cheyenne Mountain for 3 years. We lived on the east side of Colorado Springs (at the time it was the outskirts but last time we were there, there was a 4 lane highway and much more development further east.). We had a perfect view of Pikes Peak from our deck. It was our best assignment. Our son was born at the A. F. Academy. We spent many days hiking, and exploring the area. We loved Garden of the Gods, driving up into the mountains to visit Florissant Fossil Beds, Cripple Creek, and going to the Flying W Ranch for their cowboy dinners. Sadly it burned to the ground during a forest fire several years ago. Trips to Denver for the Natural Science Museum were favorites for the kids. Our favorite long trip was to Mesa Verde National Park. The Durango to Silverton train ride is spectacular. My husband and our girls enjoyed the skiing. We loved going to the football games at the Academy, especially there inter-service games. We attended the dawn balloon launch the first year they had the festival and it was magical. We pass through when we are out West, but I never want to go by our old house. It hurts. I wish we could have retired there. Yes we did go to the top of Pikes Peak. My first time to experience grey out. The dessert looks yummy, but I don't care for Nutella. I love the photos and post on your trip. Have not been to Colorado buy always imagined it would be beautiful. And I was rather envious for the dessert. One year while visiting Colorado Springs for New Years Eve. I watched the skier's come down Pikes Peak at midnight,they somehow were illuminated. It was a beautiful & unforgetable sight. The flight into Colorado Springs that day was also interesting. A gentleman had a dozen red roses for the lady he was to visit in the Springs. I commented on how romantic that he was! He offered me a rose. I declined, not wanting to break up the dozen. He did let me hold the beautiful & fragrant flowers for a good part of the flight. Such happy memories. I loved your pictures! I've never been but I definitely want to go one day. And yes, your nutella dessert looked wonderfully delicious! Helen Gonzalez from the high desert of California. Been to Col Springs, went to Bee Pub, Garden of the Gods, Seven Falls, a park for kids. Beautiful country. Oh, yes Broadmoor was gorgeous and stayed in a beautiful hotel Cheyenne Mtn Hotel with a pool and good eats. I have never been to Colorado. It looks wonderful with all your spectacular photos, and yes the Nutella dessert and other foods look fabulous. Thanks for sharing.